Hartford Flower Show is going on! The Connecticut Flower and Garden Show is going on this weekend in Hartford. It started today, Thursday the 18th and will run through Sunday the 21st. 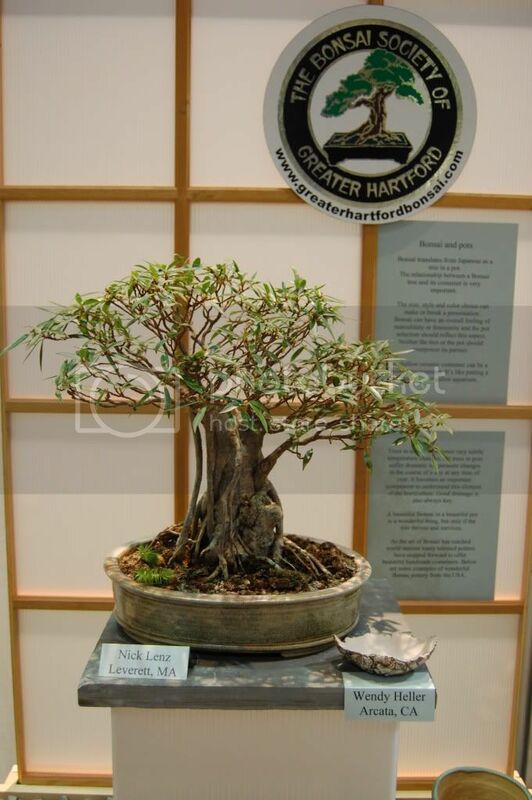 I was working one of my bonsai clubs tables showing beautiful containers made by craftsmen here in the US. Lots of vendors and some very nice displays. It's a good show, so if you're in the area, stop on in! Lots (and lots) of eye candy? I chatted with the folks at the CBS booth too; I see you were also taken with the formal cascade. I guess the membership is split on whether it should remain a formal cascade or lose that last cloud and become a semi-cascade. The owner has said they can buy the tree from him and cut it where they like, but they can pound sand until then . There WAS a lot more to the show, but less big exhibit spaces it seemed. Still the commercial booths were full, the speakers were good (Saw my new friend Kathleen Nelson there talking about invasives; way to go Kathleen!). One big trend being brought out by my old alma mater, Prides Corner Farms, is green roofing, and it made appearances there and at PAn's Garden, my friend Denise Ciatsko's operation as well. Here is a green idea that really can help our planet; albedo effects or reflected sunlight is an increasing issue globally and a recognized issue in big cities (we have known of the "oases of sunshine" effect since the Fifties, making cities hotter and drier. Nice to see a gardening solution to this sort of issue. My favorite displaye exhibit was my old schoolmate's herb garden. Petie Reed runs Perennial Harmony, an organic garden center ( ) in Waterford CT, and her herb garden was sweet, and functional, and GREEN! You go girl! My good buddy Nancy Dubrule Clemente was there judging and holding court (still the reigning queen of green in CT; Petie would agree with me, as she learned from Nancy). I will be meeting her to film some short pieces for youtube on Sunday; I will post links to those as soon as they are available... Nancy is coming to the Internet in her usual style; fast, with gobs of positive energy to grease the skids, and the joyful enthusiasm of a big kid. There is little secret that's why I love her to pieces. Stop by and tell her I said hi. Or go to the Natureworks Facebook page and become a fan. After a cold and snowy spell, it was nice to see blooms and flowers and smell mulch and growing things. This is always a cheap fix for the true gardening junkie, and well worth it. Kristie is a true pro and has put on a great show as usual. Nice job. So what are you doing reading this? GO!